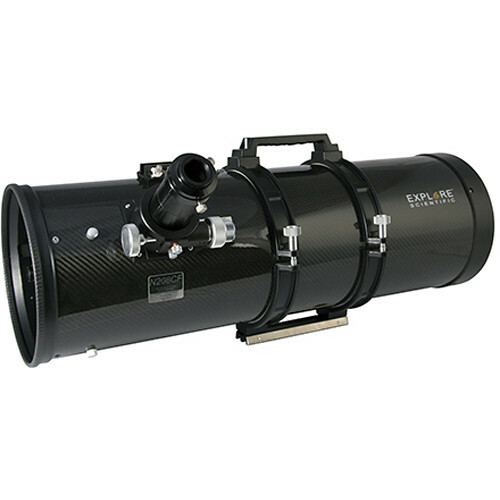 Designed for astrophotographers and imagers who have a platform and want to add a powerful and fast Newtonian to their arsenal of OTAs, Explore Scientific offers the PN208 8" f/4 Carbon Fiber Photo Reflector Telescope here with a 8x50 illuminated finderscope and a 2" Crayford-style focuser, but without a mount or tripod. 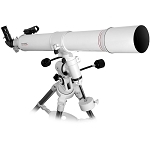 The optical tube assembly features a Newtonian reflector design with a 8" aperture and a f/4 focal ratio to make planets and the Moon to appear bright and clear while having the capacity to see out of the solar system to observe and image nebulae, galaxies, and binary stars. The OTA is made of lightweight and strong carbon fiber. This material is highly resistant to temperature changes - such as moving from a warm house into a Fall night. 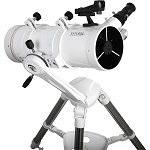 Drastic temperature swings can cause metal OTAs to expand and contract, which can cause the delicate optics to move out of collimation over time. 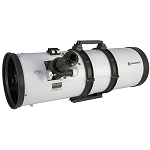 Its Crayford focuser uses a friction system to move the draw tube in and out, which enables much more precise focusing without backlash - an important feature in achieving tack-sharp images. While there is no mount included, a mounting cradle-ring assembly is provided. 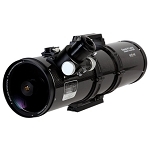 It clamps over the optical tube and lets the user adjust the orientation and position of the scope relative to the mount to optimize viewing comfort and balancing, while avoiding interference with other equipment. 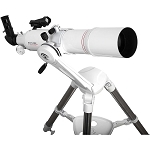 A stainless steel Vixen-style dovetail plate makes it compatible with any alt-az or equatorial mount with a Vixen-style saddle and a top handle provides a safe handling point during set up and break down.